Ya hace varias semana que no os hablo de cine… ¡y la verdad es que lo echo de menos…! Así que aprovechando esta asfixiante ola de calor que nos ha invadido estos días hoy os presento una película muy adecuada para esta época: El largo y cálido verano. Esta película (además de ser la primera en la que Newman aparecía con su mujer Joanne Woodward) fue la demostración de que era algo más que una cara bonita ya que ganó el premio al mejor actor en el Festival de Cannes de aquel año. ¡¡Feliz fin de semana chicas!! It’s been for a while that I don’t talk you about cinema and to be honest… I miss it!! 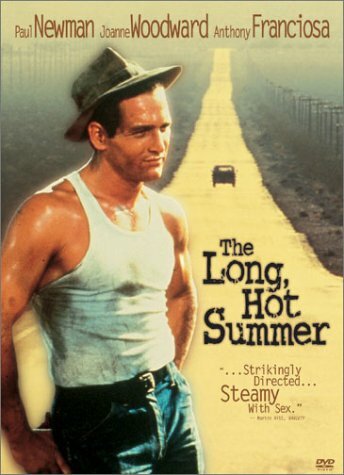 So “taking advantage” of this suffocating heat wave that has invaded Spain today I present you a film very adequate for this time of the year: The hot, long summer. Besides the fact that this was the first film where Newman appeared with her wife (Woodward), it also was his opportunity to show that he was much more than a pretty face as he won the Best Actor award in the Cannes Film Festival of that year. The outstanding performances of the actors are worth to see, leaded by Orson Welles (immense in every sense of the word), Paul Newman (smashing in every sense of the word) and accompanied by the great Joanne Woodward, the beautiful Lee Remick and the funny Angela Lansbury. I love that pink lemonade!!! Isn't this girly dress lovely too?? En serio chicas ¿¿qué mujer es capaz de resistir ESTO?? Seriously ladies, which woman is capable of resist THIS?? me encantan los carteles antiguos!!! i wish i grew up in this era <3 these photos are lovely! I love old movies, I'll have to check this one out. Paul Newman was so handsome. Pero qué guarapo!! Me apunto la peli para este verano. I love your posts on iconic movies, and I love Paul Newman. Now I want to watch this one; perfect for summer. i absolutely adore all the fashion in these old-school films! I love that dress too! The clothes in these scenes are awesome! I haven't seen this movie but it has a great cast so I need to add this to my Netflix queue. Una de las cosas que tengo intención de hacer este verano es ver mucho cine clásico, y creo que esta peli no me la voy a perder. Paul Newman, los ojos más bellos del cine. Hey! Your blog is really interesting.I just stopped by and thought to introduce my blog. I post almost everyday about high and low fashion, from Japan. Love to improve myself, and trying my best on my blog right now. So hopefully you'll come by. Also, if you like it, please follow:) Thanks for taking your time, ciao and hope you come and visit. I am definitely going to have to check out this movie! Paul Newmann was incredibly handsome! OMG!!! I'm following you right now on Google Friend Connect №392 & Bloglovin №52. hope you can follow me on Bloglovin too!!! i love the classic movies! wow...i dream with this classic movies! !